The Pool of Fire is the third book in the Tripods series by John Christopher. I'm reposting my reviews in tribute to this great science fiction writer who died last week. This book is a little more fragmented than the others - it's really several different episodes involving Will and his companions in the battle against the Tripods. But it's an exciting story, and anyone who enjoyed the first two books will enjoy this one. One of the things that makes Will such a likeable character is that he's an ordinary boy. He's not the smartest, or the most disciplined, or even the most heroic, but he still manages to be in the thick of the war, striking blow after blow against the tyrannical rulers of the Earth. Through Will we come to believe that anyone can be a hero. I've never been a hug science fiction fan. I did love Star Trek Voyager. Does that count? And A Wrinkle in Time is my favorite kid lit book EVER. That is sorta SF, right? Maybe I just need a clearer definition of science fiction. Maybe I love it and just don't know it. Science fiction is really such a broad genre that it's possible that you love it and don't know it. For example, dystopian and post-apocalyptic stories, which are very popular right now, are generally considered to fall under the science fiction umbrella, as they usually involve speculative futures. A Wrinkle in Time has always been one of my favorites, too! Thanks for stopping by. 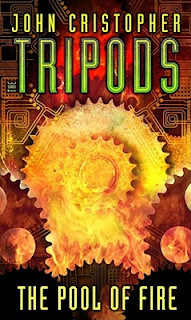 I didn't know the creator of Tripods had died. How sad. I remember watching that show when I was a teenager. It was brilliant. The special effects were terrible, but the story line was wonderful. I loved the characters, particularly Beanpole. Hopefully someday they'll remake the series with better special effects. Wow, I didn't even know there was a show made of the series. Thanks for the info, Shevi.